Activists raise their hands as they demand justice for the killing of Michael Brown while marching to the Thomas F. Eagleton United States Courthouse from City Hall in downtown St. Louis, Missouri, Aug. 26, 2014. More than 100 demonstrators marched peacefully in St. Louis on Tuesday, calling for the arrest of a white police officer who shot dead an unarmed black teenager in Ferguson, Missouri, almost three weeks ago. By nightfall, a small group of about 30 protesters marched along the street that has been the center of demonstrations since the death of 18-year-old Michael Brown in Ferguson, where the majority of residents are black and most elected officials and police are white. The atmosphere was subdued and the police presence was limited. Brown's death focused global attention on the state of race relations in the United States and evoked memories of other racially charged cases, including the fatal shooting of Trayvon Martin, a 17-year-old African-American, in Florida in 2012. 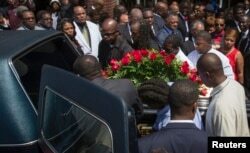 Lesley McSpadden (R, in red) watches as the casket containing the body of her son Michael Brown lifted into a hearse after his funeral services at Friendly Temple Missionary Baptist Church, St. Louis, Missouri, August 25, 2014. Family and supporters of Brown celebrated his life on Monday at a music-filled funeral service at a St. Louis church that rang with calls for peace and police reforms. The August 9 shooting sparked two weeks of racially-charged demonstrations, some with violent clashes and scores of arrests, in which protesters Wilson be charged in Brown's death. Demonstrations have been more subdued in recent days. Police have said Brown struggled with Wilson, who shot and killed him. However, some witnesses say Brown held up his hands and was surrendering when he was shot multiple times in the head and chest.